Yves De Mey‘s musical journey consists of many different paths. During the second half of the 90s, his releases were clearly rooted in breakbeat and UK drum’n’bass. Soon after that, the work for theatre and dance performances and large scale sound installations, spawned his interest in experimental sound design. Around 2009, his ever-expanding modular synthesizer system became De Mey’s main studio tool. His releases have appeared on labels such as Sandwell District, Opal Tapes and others. In 2014, he started producing under a new moniker called Grey Branches to channel his more dance-oriented output. 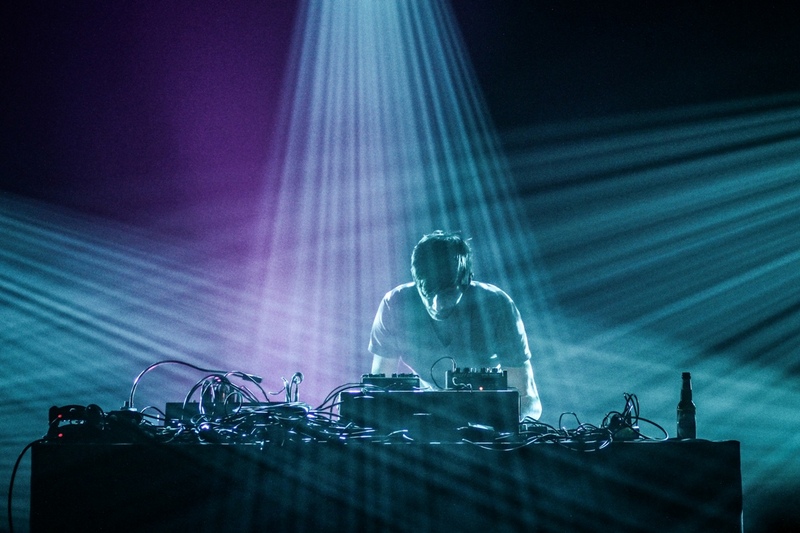 Together with Peter Van Hoesen, he runs the Archives Intérieures imprint. We met during the ICAS Festival in Dresden, where he was set to perform. Can you talk about your musical background? Yves De Mey: I started very early around the age of 15. I was experimenting with old synthesizers and four track tape recorders, but at the same time, I was also playing organ in a 60s garage band. After that I played drums in a band and I also had a duo and did this kind of industrial metal, and at a certain point my guitar player said “I can’t follow your beats anymore. It’s getting too complicated to play with them”, and we split up. I decided time was probably right for me to do something solo. It was a good time for electronic music as well, as it was the emergence of the likes of Autechre, Pan Sonic, and I was totally into that. It was a new world opening up for me. A few years later, there was all this jungle and drum’n’bass happening, and I always wanted to combine this. Acid techno was also a big love of mine. The first thing that I released was a remix for a British label called Ill. The real deal started when I got the opportunity to do a score for a theatre play in Belgium and I left my full time job to become independent and started doing scores for performing arts combined with sound installations, but at the same time, I kept producing music for myself. I tried to channel my love for sound design and composing for performing arts and installations into something that translates very well to records and live shows. I guess I’m still working on that 16 years later. Right now I’m arriving at a point where I want to be and I don’t feel embarrassed about something that I did three months ago. Why do you think you feel like that now, is it a case of coming of age? YDM: I feel more certain about actions that I do in the studio, it feels less like trying and more like doing. I think it’s about self-confidence and, of course, mastering a technique. You are not just fiddling around, you purposefully go to work. YDM: When working for performing arts or movies, there’s a framework that you have to work in. You have to take a lot of things into account like voice, other sounds and, especially, the ideas of the director. Obviously I feel more free when I work for my solo stuff, but at the same time it’s very interesting to work within limitations of a certain project because you learn a lot from restrictions. Freedom is a great thing, but if you decide to work within the conventions and work with a strict amount of tools, things actually go faster. You might not necessarily be 100 percent happy about the end result because it’s always a consensus that you have to do, but at the same time – first of all it pays the rent, and it’s also a big challenge to be able to translate someone else’s idea into your own perspective. Some artists want a clear separation. They have a totally unrelated day job and then they have the music in order to keep their creativity intact. YDM: For several years, I did quite a lot of commercial work. The attitude and ambiguity of this type of work is really draining, especially working with people from agencies who think they come up with something extremely original that’s been done like 25 times before. Sometimes I think maybe I should do a totally different job during the day to preserve my brain and energy to be able to do the other stuff at night, but right now I don’t really feel the need. I’m very fortunate that I can be in a studio environment 24/7. As long as I have the feeling that both things can feed off each other creatively, it’s perfectly fine for me. When it comes to your own music, it is also varied – you have a more techno-oriented approach and an offbeat/experimental one, each of which probably also channels something that’s in you. YDM: It was probably one of the best decisions that I’ve made “career-wise” to start this new Grey Branches project. It is much more clear for people to know what to expect, but also for myself, as it’s a totally different approach to music making, but with the same tools. When I do the Grey Branches stuff, I try to hook up all my gear to make it into one big machine following a pulse with everything synced together. When I do my more experimental stuff, there is no pulse and everything is still connected, but more in a loose fashion, it’s more organic. It really works very well in my head to have this clear separation. Even just two years ago, there was always this desire to do something techno-influenced, but the fact that you are working in a very rhythmical fashion dominates the other kinds of sounds that you are making, at least for me. Now I can just say, Ok, I feel more in a rhythm driven mood, I work for Grey Branches, and if I’m in a totally free mood, then it’s all the other work that I do. I can even imagine there’s even going to be another project to split up the experimental work, too. What would you say is the common thread going through the work? YDM: Most of the feedback that I get from people is about the sound. Whether it’s for my experimental work or Grey Branches, there’s a signature sound that I might have. It’s something that I’m not pretending to have, but definitely working towards. Are you also conscious of triggering certain moods with your more atmospheric side? YDM: Definitely. It’s like people are messing with my time-space continuum, and I really like it. For instance last year in Japan, Bee Mask played an incredible live set, and it’s something I really have to think about every day. It was atmospheric, but also rhythmical. He totally messed with the whole perception in that hour. I even couldn’t deal with it in the first five to ten minutes. Then my mind and body opened up and afterwards I was wondering where I’ve just been. I probably look for that also in the music that I buy. I hardly ever buy techno, it’s probably more the experimental and mental stuff. I really look for something that takes the experience of reality away. It’s like watching a Rothko painting, you dive into it and want to stay there for an hour. YDM: Yes, and it doesn’t necessarily have to do with the power or the volume. There’s a lot of drone artists who make beautiful minimal music when they do an album, but as soon as they play live, they blast it out and there’s no nuance left. Everybody wants to go macho and play loud and it’s a shame. It’s also an artistic choice. Bee Mask could have also played much louder. It’s very demanding because it’s another kind of engagement that you have to show as an audience, but once you give in to that, it’s like a conversation that starts to develop. That said, in general, I can really appreciate loud music, at least when it’s on a good sound system. Techno has also became more atmospheric in terms of embracing noise. YDM: It’s not necessarily a very good evolution in techno that it’s all becoming very dirty and raw, because what I miss is craftsmanship. I hear a lot of noisy techno these days, and to me it’s all extremely boring, because it’s been done before. It’s also that I’m 42 now, and I spent my youth listening to Einstürzende Neubauten, and then you probably have heard everything that has to do with noise. But maybe for these kids it’s about not having this attachment to history. YDM: Might be, but still, it often feels like it’s easy for them to do, and I wonder where is the challenge in that. That’s a very important element in creative work, to set yourself a challenge. It doesn’t have to be complicated, but it shouldn’t be easy either. These days the aesthetic criteria have become less stringent, anything goes. Where do you think electronic music could go in the future? YDM: Innovation is important. Preferably in a slow way. Usually when innovation happens, it quickly turns into a trend instead of a movement. That’s an important difference. What I see is that there are some acts who have been around for 15/20 years, and they still evolve. When they evolve, I feel that it becomes more “traditionally musical” or maybe simply better done, while still being widely experimental. That’s definitely a direction I would like to go into. I don’t think I will be able to play the Grey Branches stuff when I’m sixty, but I definitely want to play music at that age, so I need to start looking into how I could go from being a producer to a being a good composer.